James Paxton had already completed eight sparking innings, having struck out Angels star Mike Trout four times. Then with one down in the ninth of a 3-1 win, Andrelton Simmons smashed a line drive off Paxton’s throwing arm, forcing him from the game clutching his arm in pain. 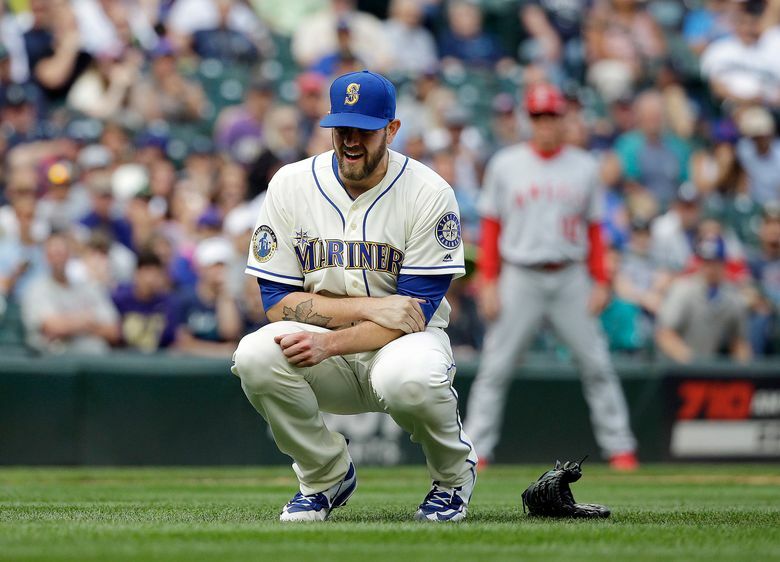 It wouldn’t have been representative of James Paxton’s star-crossed career nor of these increasingly feisty but still unproven Mariners had Sunday’s breakthrough victory not caused hearts to temporarily jump into throats throughout Safeco Field. Paxton was two outs from finishing off one of the signature outings of his career. The left-hander had been dominant for more than eight innings, striking out Angels star Mike Trout four times. Seattle was on track for its first series sweep since the beginning of last month, three straight wins in front of capacity crowds who’d packed Safeco for Ken Griffey Jr.’s number retirement weekend. Then Paxton took a sharp line drive off the elbow of his throwing arm. And instead of departing to a standing ovation as he’d done an inning earlier, Paxton hobbled toward the dugout wincing in pain. Tom Wilhelmsen followed out of the bullpen to seal a 3-1 Mariners win and a weekend series sweep of the Angels in front of 44,812 at Safeco. Seattle (57-53) leapt over Houston into second place in the American League West. In the wild-card race, it pulled within 3.5 games of Detroit – which it hosts Monday through Wednesday in a suddenly pivotal three-game set. But the postgame Paxton update was reassuring: The X-rays came back negative. He did not break any bones and has officially been diagnosed with a left-elbow contusion, to be reevaluated on Monday. And yet for a team that has now won 11 of 18 games and just completed a weekend of positive vibes, there were mixed emotions in the home clubhouse afterward. Los Angeles (49-62) opened the scoring in the top of the third, turning a one-out error by shortstop Shawn O’Malley into an unearned run via Kole Calhoun’s two-out single. Seattle answered back one frame later, consecutive singles from Seth Smith, Kyle Seager and Nelson Cruz knotting the score at one. Adam Lind was hit by a pitch from Angels starter Matt Shoemaker, loading the bases for Leonys Martin. And, fitting with the overall theme of the weekend, Trout made an incredible play that ultimately had no bearing on the outcome of the game – this time breaking out his best Junior impression. Martin lifted a would-be grand slam deep into center field, admitting afterward that he’d thought it was gone. Trout sprinted backward from the 24 etched into the outfield grass, then braced himself against the outfield wall. He timed his leap perfectly and plucked the ball back from over the yellow line and the dark abyss beyond. But not even Trout could prevent Kyle Seager from scoring what would stand up as the game’s winning run on a sacrifice fly after he landed back on the warning track with ball in glove. The awestruck hush that fell over the standing-room-only crowd of didn’t last long. Mike Freeman, claimed by the Mariners on waivers just last week and who’d entered Sunday without a single career MLB hit, tallied his second of the day with a two-out, RBI single to right. Paxton (4-5, 3.54 ERA) took it from there, throwing 81/3 innings without allowing a single earned run. He scattered four hits and walked just a single batter, striking out six. The big lefty was sharp from the outset, hitting his spots and popping catcher Mike Zunino’s mitt. Paxton got ahead in counts and worked aggressively, the radar gun spiking at 99 miles per hour. Paxton walked off the field to a standing ovation in the middle of the eighth, having just struck out Trout for the fourth time and ensuring that one of the most memorable catches ever made in the House that Griffey Built was rendered a footnote. Had Edwin Diaz been available, Paxton likely wouldn’t have gone back out for the ninth, Servais said. But the closer was being given a designated day off to rest his arm, so Paxton trotted back out of the dugout in pursuit of his first-career complete game. “I thought today was his day,” Servais said. “I talked to him after the eighth inning. He felt great, he wanted to go back out there. … I can’t say enough about the job he did. Matt Pentz: 206-464-3184 or mpentz@seattletimes.com.